BOONE, N.C. — For anyone who considered Appalachian State’s home-opening football game against Old Dominion the prelude to next Saturday’s main event versus Miami, there might have been disappointment even with a 31-7 victory before 23,374 spectators at Kidd Brewer Stadium. But after last week’s heartbreaking overtime loss at Tennessee, the Mountaineers were grateful to secure a win of any kind, even for what it lacked in artistic quality. Tailback Marcus Cox provided App State (1-1) with most of the offense it needed, rushing for 133 yards and three touchdowns on just 18 carries and the ASU defense overwhelmed the Monarchs’ spread attack on an afternoon where the Mountaineers were never really threatened. It was also obvious to everyone who watched that the Mountaineers could have easily won by a much greater margin against ODU (1-1). App State steamrolled to touchdowns on its first two possessions, with Cox finishing off the drives with scoring runs of one and two yards and the Mountaineers appeared poised to score third time with a second and goal at the ODU two as the first period wound down. But that drive died and freshman kicker Michael Rubino — coming off a shaky first game, where he missed an extra point and a potential game-winning field goal —was called on to extend the lead with his 20-yard three-pointer to make it 17-0. 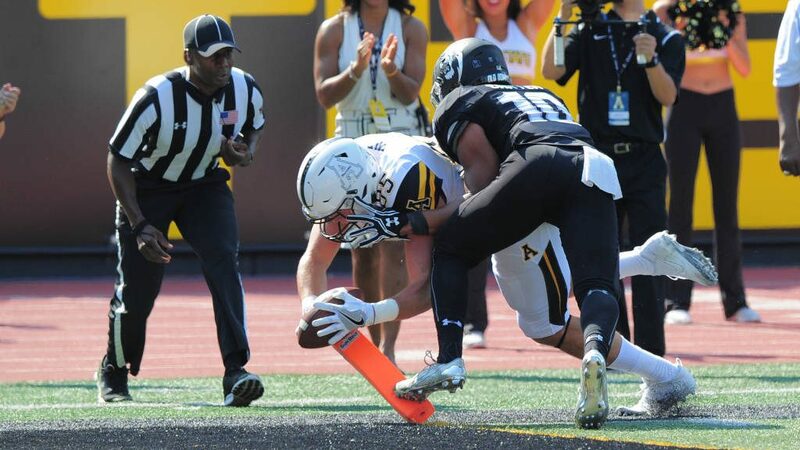 ASU then came up empty following a five-yard, shanked Monarch punt when Taylor Lamb’s third-yard pass from the nine was hauled barely off-of-bounds by receiver Jaylan Barbour and place-holder Bentlee Critcher’s fake-field goal run was stuffed at the ODU eight. Old Dominion’s offense showed signs of life for one of the few times of the game when it constructed a seven-play, 92-yard march, capped by Ray Lawry’s 27-yard scoring scamper to cut Appalachian’s lead to 10 points. Lawry gained 119 yards on 15 rushing attempts. The Mountaineers regained control before the half ended, not surprisingly when Cox reentered the game. A dash of 14 yards by the hard-charging senior started the surge and Lamb’s 28-yard strike to Jaquil Capel moved the ball to the ODU 10. Cox banged into the end zone on the next play for his third touchdown as Appalachian expanded it advantage to 24-7 at the half. With much of the crowd heading for the exits, both offenses seemed to lose interest, or at least execution, after the break. Old Dominion’s best scoring threat in the second half was killed by cornerback Clifton Duck’s interception in the end zone with the Monarchs at the ASU 15 in the third quarter. The Mountaineers waited until the final minute of the fourth quarter to score the only touchdown of the second half when backup quarterback J.P. Caruso plowed across the goal line from the one. One positive on offense for the Mountaineers was the performance of senior tight end Barrett Burns, who caught three passes for a career-high 66 yards. Libebackers Eric Boggs and Keenan Gilchrist sparkled on defense for Appalachian, combining for 23 tackles.